Two 80cm x 200cm beds for Twin occupancy or a King Sized 160cm x 200cm bed for Double occupancy. A cool ground floor room, with its own direct access to the pool side of the house. Views across the fields. 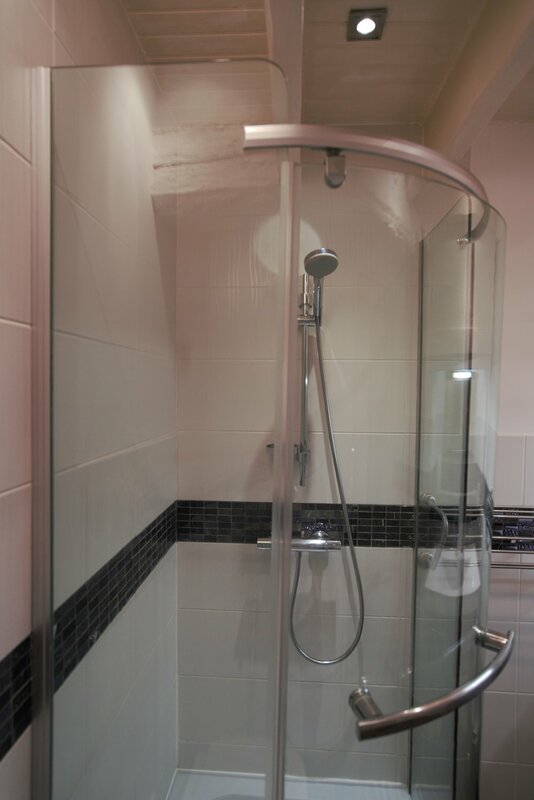 The large en suite has stylish double stone basins and huge walk-in shower with rainfall shower head. Floors are terracotta throughout, but bedroom has thick rugs as well. Can be used as a Twin with 90cm x 200cm single beds or Superking Double 180cm x 200cm for couples. Double door wardrobe and large chest of drawers. A small dressing table and chair. 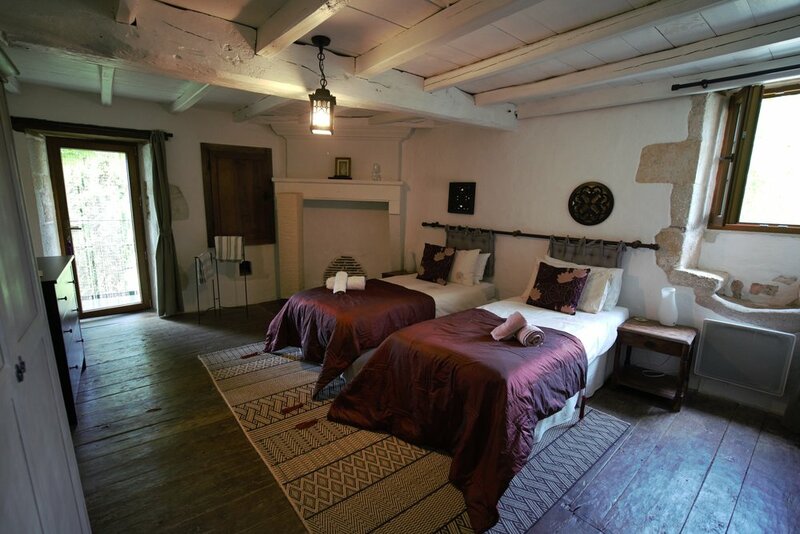 Situated in the oldest and quietest part of the house, it has ancient oak floor boards loads of other original features. This cool room has its own entrance via an outside staircase. The shower room has a thermostatic shower. THE REMAINING ROOMS IN THE HOUSE ARE ON THE FIRST FLOOR, SERVED BY A LANDING. 30m2 including en suite shower room. Set out as a Triple room with three single 90 x 200 metal framed daybed style beds. Old oak floors and a great view over the pool and countryside. Thermostatic shower. Double door wardroom and small beside tables with drawer space. The Blue is a cute twin room and shares a shower room located just outside its door. 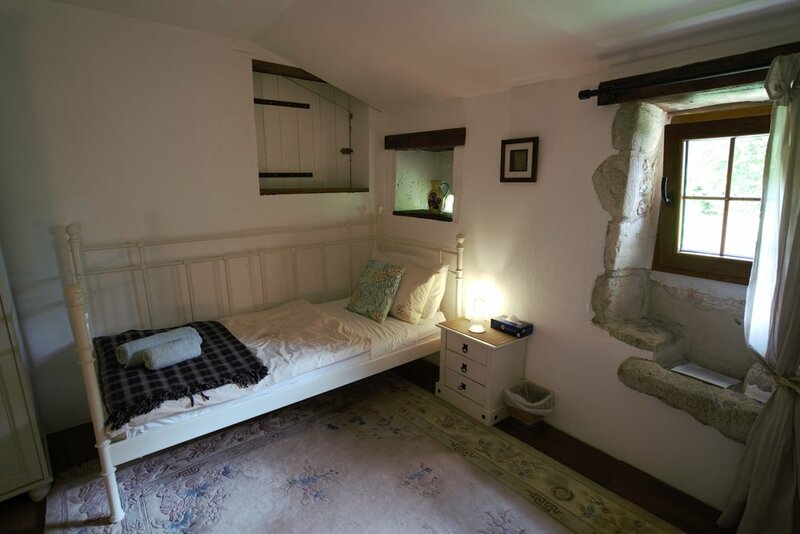 It has garden views and is a cool room, with original features like a stone window sink and dovecote windows. Two white metal 'daybed style' beds. It shares a bathroom with the occupant of the Green Room. The bathroom is just a few steps away from each of bedroom's doors. Single door mirrored wardrobe with drawer. 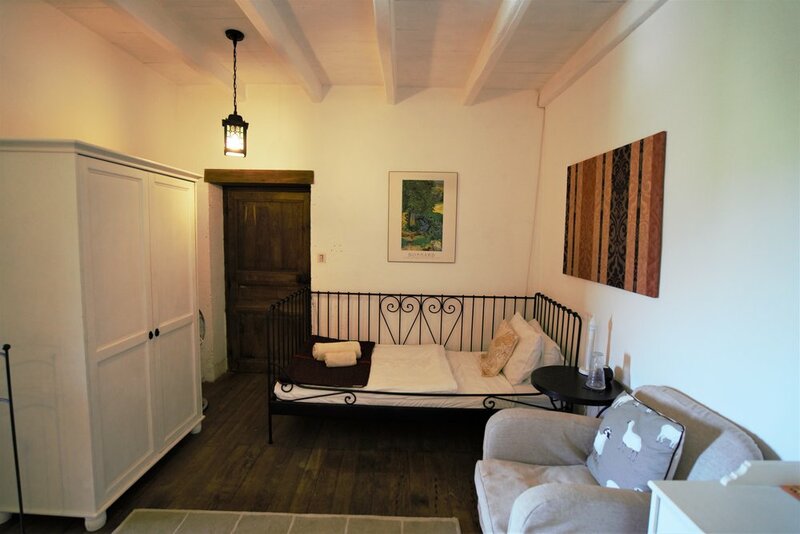 The Green is a cute single room and shares the shower room with the Blue room. It has a super view over the pool and out to the countryside beyond. It has a charming metal framed 'daybed style' bed 90cm x 200cm. 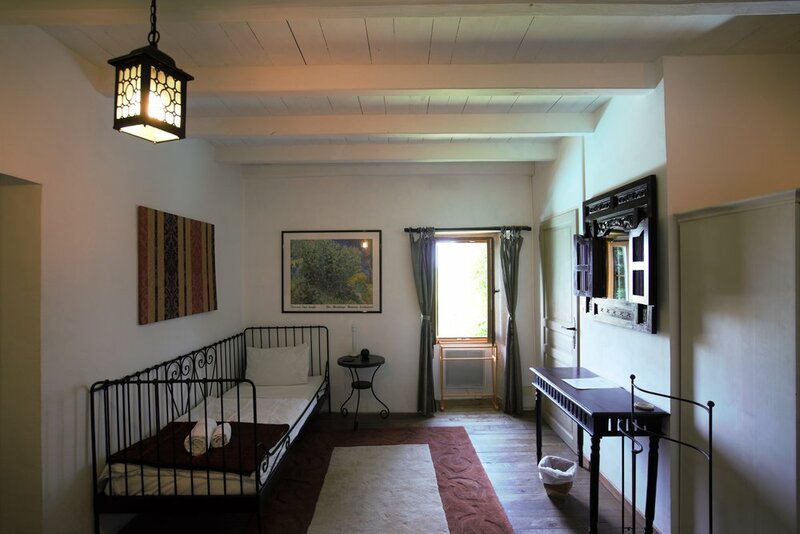 Two single rooms, each with its own bathroom area inside. 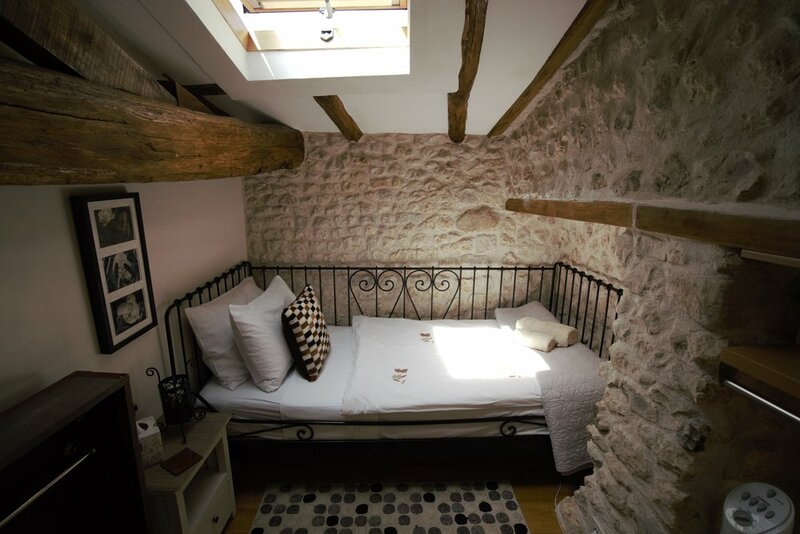 We kept the old roof beams and some exposed stone walls to make sure these little rooms kept their character. Each have a metal framed daybed 90 x 200cm. Roof windows allow star gazing! Both have underfloor heating and fans. 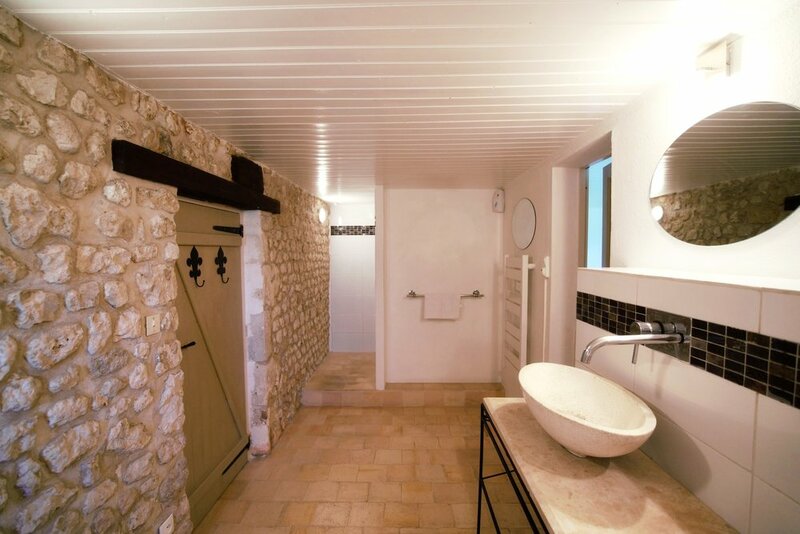 The bathroom areas are tiled in stone and glass mosaic and feature a spectacular curved wall walk-in showers with rain shower head, stone basin and toilet. Each 20m2 including en-suite bathroom. Solid wooden lodges, with private bathrooms and a standard size double bed 140 x 190cm. They are set apart from the house and each other, and are therefore perfect for single guests or couples who want a little more separation/quiet/privacy. Available for occupancy by a single guest or a couple only. 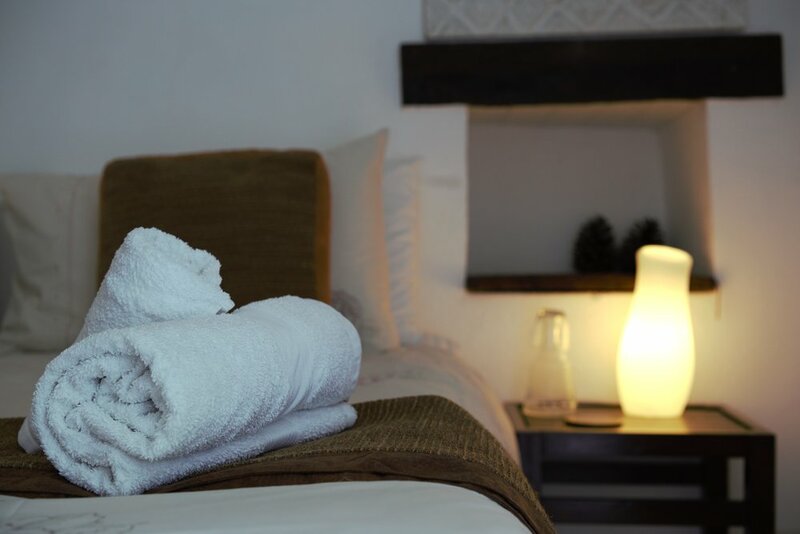 The Lodges both have underfloor heating for cooler times and air-conditioning for the hottest times. Two deck chairs are with each lodge. is just behind the pool area and has views on to the lake. Down by our fruit trees it has a large decked area with views over the vegetable garden and into the countryside. It also features a large decked terrace and an automatic composting toilet (guests need to do nothing special to operate this toilet, it is fully automatic) used toilet paper should be put in the bin provided (emptied every day).